Yarra4Life, a project that aims to improve the quality of land, water and natural habitat in the Yarra Valley, has celebrated its tenth birthday with an event at ‘Tibooburra’ – a property whose owners are heavily involved in conservation and sustainable land management. Yarra4Life is a collaborative project that has been able to bring together a range of individuals, groups and organisations to deliver projects that make tangible environmental improvements and encourage and educate individuals and businesses about the need to invest in improving the Yarra environment. 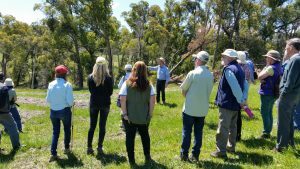 Over the past decade, Yarra4Life has been working to create necessary native vegetation links between parklands, properties and reserves in the Yarra and Yellingbo areas. This includes the protection and enhancement of priority native vegetation, which will also assist in the preservation of two of Victoria’s iconic native species – the Helmeted Honeyeater and the Leadbeater’s Possum. One such property that is contributing to this effort is ‘Tibooburra’, owned by the Kerr family. ‘Tibooburra’ is a spectacular 500 hectare grazing and viticulture property in the Yarra Valley with approximately 10% of land dedicated to nature conservation. Both the Port Phillip & Westernport CMA and Melbourne Water have supported a range of environmental projects on the property, including revegetation works to connect remnant vegetation and stream front works. This has made it an ideal location for Yarra4Life partners and property owners to gather and celebrate ten years of achievement in the area. “I am very proud of the achievements that have been made by our partners and property owners involved in the project, such as the Kerr family and I look forward to another ten years of action across the Yarra Valley”. For further information about Yarra4Life, or to get involved, visit www.yarra4life.com.au.